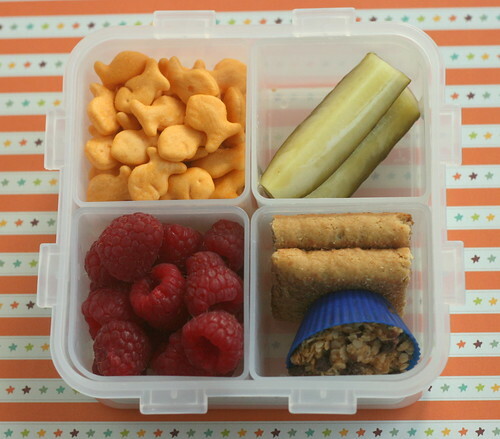 Fishie crackers, pickles, cereal bar and homemade granola bite, raspberries. Not pictured: Thermos Funtainer of ice cold grape juice, Gatorade and a huge bottle of ice water on a lanyard. It's HOT and yesterday's Cub Scout activities left the poor boy dangerously close to severe dehydration. :( Hoping today he will be more cognizant of drinking water. Though I had given him a mommy lecture Monday morning about drinking water throughout the day, nothing could have sent home that message as strongly as him feeling like complete crapola for the rest of day like he did yesterday. If he's not in better shape after today's camp I'm not sure he will attend the rest of the week. Sigh. Hi there. Do you find the Funtainers keep beverages cold longer than others? My very-nearly-4yo will be going to OT two days a week and needing snacks/bev. Thank you for your always motivating posts and creative food ideas. I read your posts everyday and am inspired to keep on truckin'. So thanks! I still need to try those granola bites. What kind of honey do you use again? Gave ya a blog award today. :-) Go check it out. I have this Lock N Lock without the dividers. Today I learned that you can use the cups that baby food comes in (Gerber 2.5oz containers). You can fit two in if you want the lid on or three if you dont use the lid.